inglés-what´s the problem: 71.) 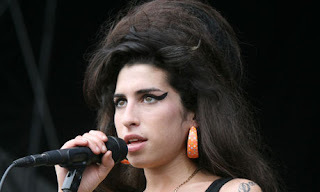 REST IN PEACE "AMY" ..... DESCANSA EN PAZ "AMY"
71.) REST IN PEACE "AMY" ..... DESCANSA EN PAZ "AMY"
Singer Amy Winehouse has been found dead at her house in north London She was 27. The award-winning artist, famous for 1.) hits including Rehab from the critically acclaimed album Back to Black, was discovered by police in the late afternoon. Her death was being treated on Saturday night as "unexplained" but 2.) sources said she had died of a drugs overdose. The Metropolitan police said: "We were called by London Ambulance Service to an 3.) address in Camden Square 4.) shortly before 16.05hrs following 5.) reports of a woman found 6.) deceased. On arrival officers found the body of a 27-year-old female who was pronounced dead at the scene." Winehouse was last seen with her 7.) goddaughter, Dionne Bromfield, earlier last week when the teenager performed at the iTunes festival. Tributes began to pour in to one of the most celebrated and 8.) troubled British artists of recent times. Mark Ronson, who produced Back to Black, said: "She was my musical 9.) soulmate and like a sister to me. This is one of the saddest days of my life." Singer and actress Kelly Osbourne wrote: "i cant even 10.) breathe 11.) right now, im crying 12.) so hardI I just lost one of my best friends. i love you forever Amy & will never forget the real you!" Two regulars at Winehouse's local pub, The Hawley Arms in Camden, paid tribute. "Some people might think it shows disrespect to come out drinking tonight but she was such a part of Camden she made it her home and she always got involved," said Mary Gallagher. "Amy even worked behind the bar here. She was such a 13.) lovely person and, to be honest, I don't think fame agreed with her. She was an ordinary girl 14.) at heart." A 15.) spokesman for the late singer said: "Everyone involved with Amy is 16.) shocked and devastated. Our thoughts are with her family and friends." Winehouse's father, Mitch, returned from New York, where he had been due to 17.) perform at the Blue Note jazz club. He said: 'I'm coming home. I have to be with Amy. I can't 18.) crack up for her sake. My family needs me." Winehouse had suffered a well-publicised battle with drink and drug abuse that saw her 19.) withdraw from all of her 20.) scheduled performances last month after a series of erratic performances. She started her 12-leg European tour in Belgrade but was 21.) booed off the 22.) stage after appearing to forget her lyrics. She then 23.) pulled out of performances in Istanbul and Athens before she cancelled the tour as fears for her health grew. Winehouse 24.) rose to fame with her debut album Frank in 2003, which was 25.) feted by music critics in the UK and nominated for the Mercury music prize, but it was her 2006 follow-up album, Back to Black, that catapulted her to 26. )stardom and led to five Grammy awards. The album became the 27.) third-highest selling album of the 2000s. Will you still love me tomorrow? Aún me querrás mañana? Or just a moment's pleasure? O solo un momento de placer? the magic of your sighs? en la magia de tus suspiros? meets the morning star? se encuentra con la estrella del amanecer?